• Set the wipers to continuous operation. - Turning the wipers off resumes the LKAS. • Decrease the vehicle speed to 40 mph (64 km/h) or less. 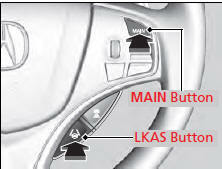 - Increasing the vehicle speed to 45 mph (72 km/h) or more resumes the LKAS. 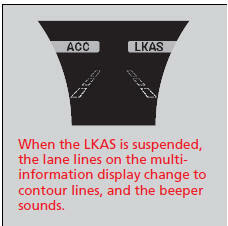 - The LKAS resumes and starts detecting the lane lines again once you release the brake pedal. • The system fails to detect lane lines. • The steering wheel is quickly turned. • You fail to steer the vehicle. • The vehicle runs on a curved road over the speed limit. • The camera temperature gets extremely high or low.